As Homer experiments with growing food year round we are lucky enough to have good eats year round. Yesterday we had fried eggs and hash browns for breakfast and he grew them both. Seed potatoes are only shipped to us once a year, in the early spring. Usually potatoes do not grow in the winter..although they can stay in the ground and be harvested. 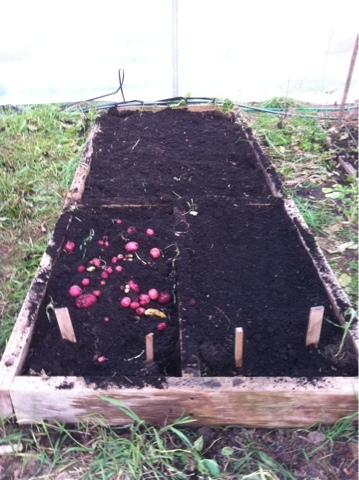 Last winter Homer planted a few potatoes in this bed. Inside the hoophouse he added another layer of protection just over the spuds. We pulled potatoes from this bed for early spring CSA distribution. And then again in the summer. He left the tiny potatoes in the bed and planted eggplant and peppers in here. Temperatures in the last few weeks have killed those plants. While cleaning up the bed the other day he discovered all of these potatoes..enough to harvest for a few meals for us..and to take the tiny ones and put them back in the ground. In just a few months he will be able to pull new potatoes from this bed. After he puts their cover on.